The Ladies’ Sodality of St. Mary Church, 228 Washington Ave. in Urbana, is hosting its 26th annual Home Made Christmas Bazaar on Friday, Nov. 16, from 3 to 7 p.m. and Saturday, Nov. 17, from 9 a.m. to 3 p.m. in the church basement. Homebaked goods will include gluten-free candy, crafts, gift items and jewelry. 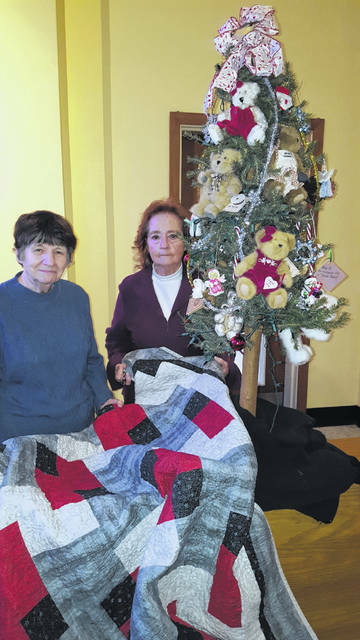 Items to be raffled at 2 p.m. include a homemade quilt dubbed “Buckeye Cobblestones,” shown in the photo with Marge Kitchen and Janice Kaster, an OSU basket, a money tree, children’s basket, men’s basket, bakery basket, framed P. Buckley Moss print and more. Raffle tickets are $1 each or six for $5. The Knights of Columbus will prepare and serve soup and sandwiches from 11 a.m. to 1 p.m. Saturday. The Champaign Dulcimer Group will entertain from 10 to 11 a.m.